Fort Caspar was a military post of the United States Army in present-day Wyoming It was named after 2nd Lieutenant Caspar Collins, a U.S. Army officer who was killed in the 1865 Battle of the Platte Bridge Station against the Lakota and Cheyenne. Originally founded in 1859 along the banks of the North Platte River as a trading post and toll bridge on the Oregon Trail, the post was later taken over by the Army and named Platte Bridge Station. It was used to protect emigrants and the telegraph line against raids from Lakota and Cheyenne in the ongoing wars between those nations and the United States. The site of the fort, near the intersection of 13th Street and Wyoming Boulevard in Casper, Wyoming and is listed in the National Register of Historic Place. The machine is located to the right in the lobby as you come in the front doors. 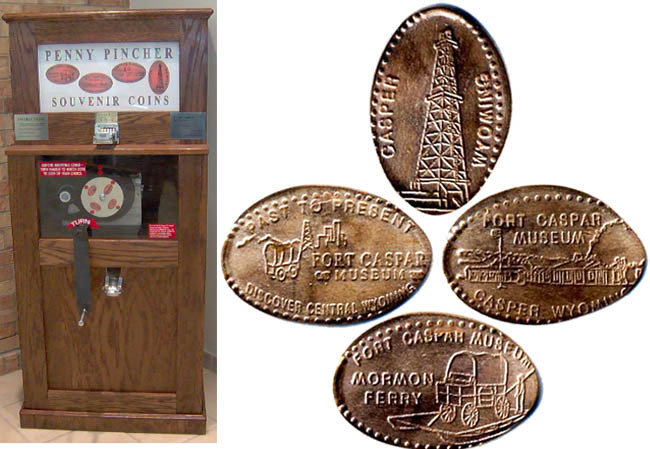 You do not have to pay museum addmission to use the penny machine. thegillion added Fort Caspar Museum to system.